25 editions of Records of the Cape Colony 1793-1831 copied for the Cape gov... found in the catalog. Add another edition? Are you sure you want to remove Records of the Cape Colony 1793-1831 copied for the Cape government from your list? from the manuscript documents in the Public Record Office, London. 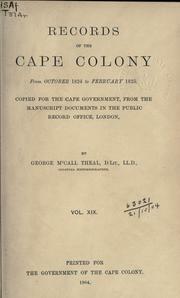 Published 1897 by Gov't of The Cape Colony in [London] .